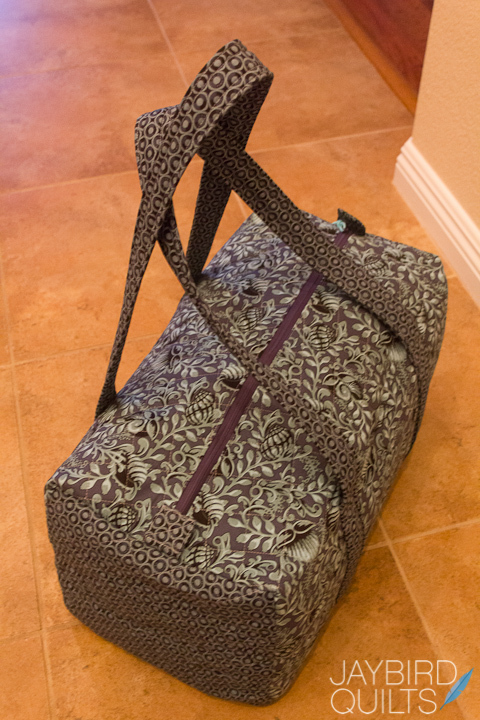 I'm headed out of town for NYE and decided that I wanted to travel handmade... specifically Tula Pink Style. 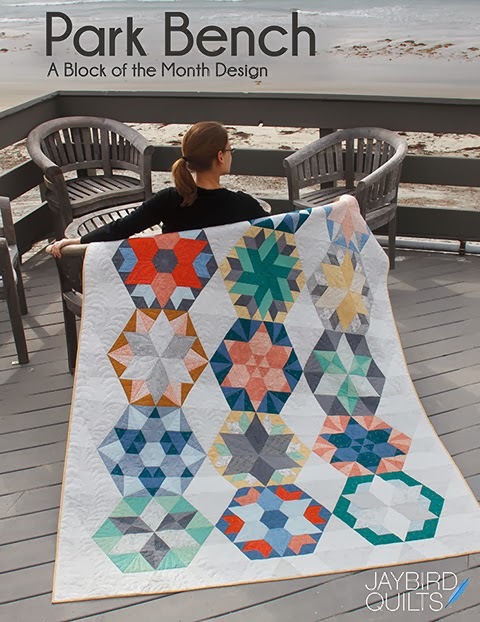 It isn't a secret that I love Tula and all of her fabrics she designs!! 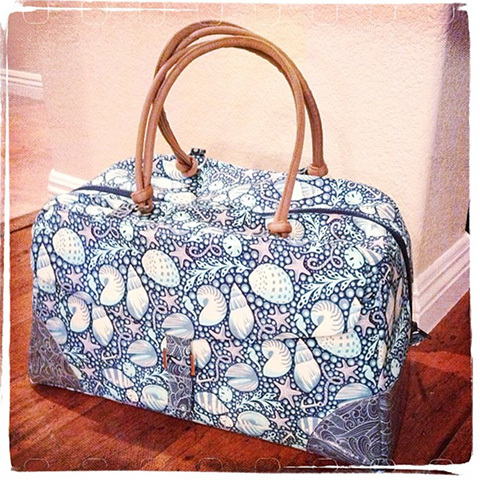 The "travel handmade" craze has been popping up on Instgram & Blogs for quilt retreats and such. 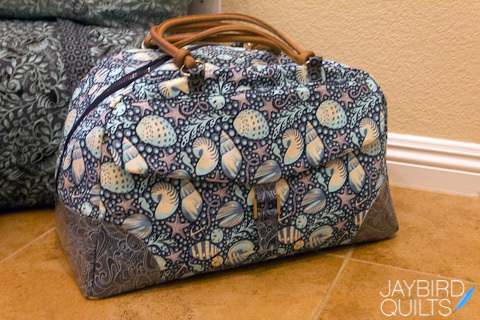 I decided this was the perfect trip to add some new bags to my collection so that I could travel with all handmade bags! Here is a breakdown of my stuff. The top bag is my Lily Pocket Purse that I made back in October. 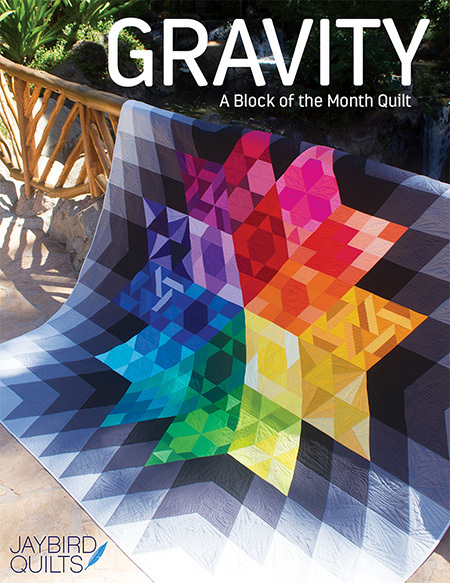 It is a pattern by Joan Hawley of Lazy Girl Designs. 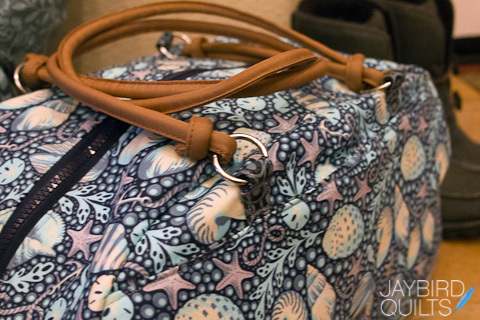 It is the perfect bag for when you want a small purse or are traveling. 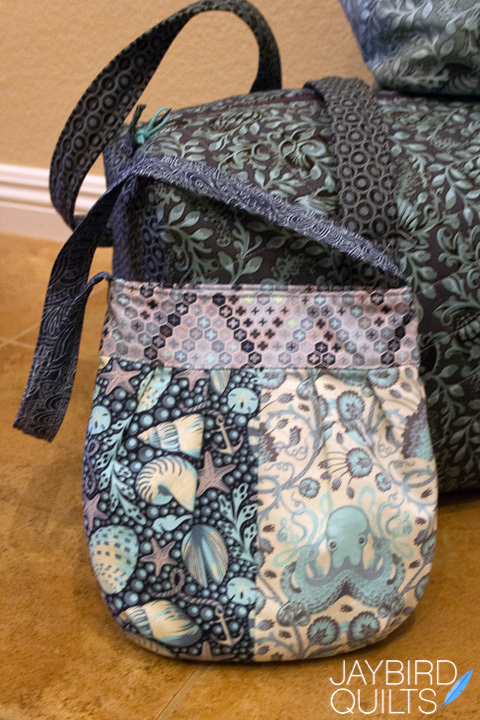 All the fabrics are from Tula's Salt Water collection. Next in the stack is my Cosmo bag from Amy Butler's Style Stitches book. I made it back in January of 2011. It is made of all Neptune fabrics. The next item is my Candy Box quilt. 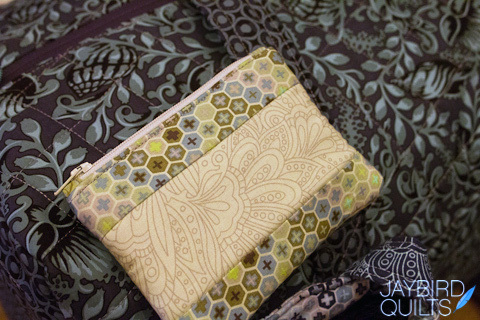 I always take a quilt with me when I travel. 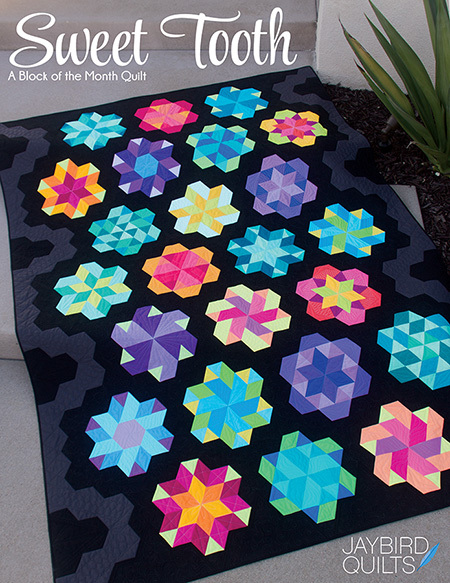 Nothing compares to cuddling up with your own quilt. 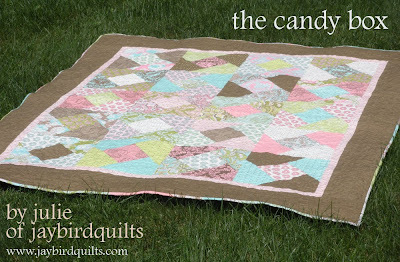 The Candy Box is a tutorial I did on the Moda Bake Shop back in 2009. 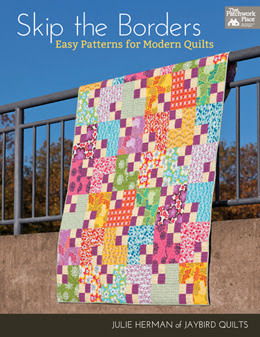 It features Tula's Hushabye fabric collection. 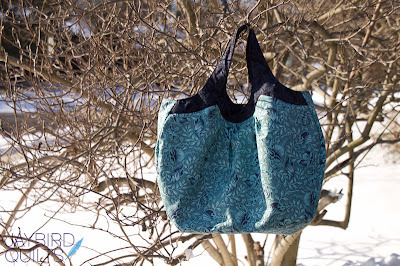 Then comes the Great Getaway bag from Lisa Lam's book, The Bag Making Bible. 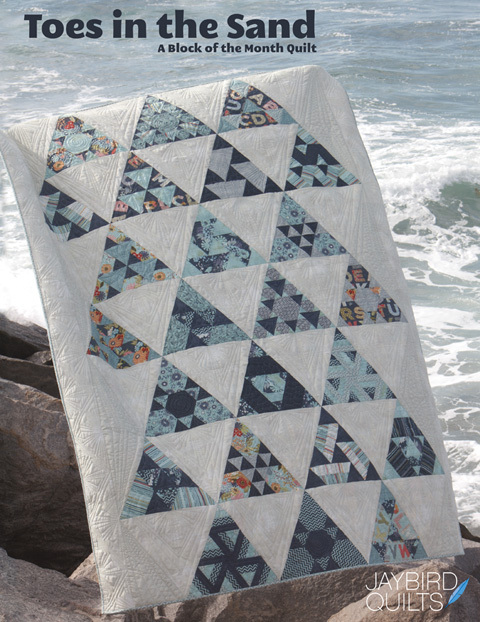 It is a mix of two fabric collections: Salt Water & Neptune. I made this bag on Thursday. Yes in just one day. I purchased ready made handles & a 30" zipper from Joanns Thursday morning when I decided I'd make the bag. The hardware is from Nancy Zieman's colletion with Clover. 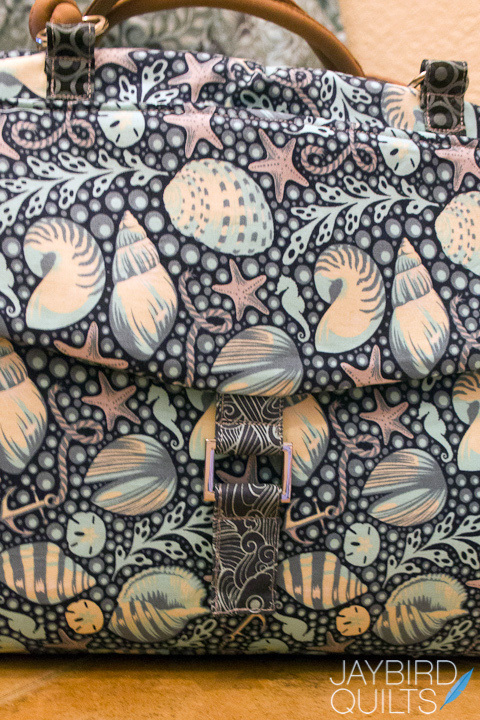 The handle tabs and clasp tab are from the Neptune collection & the main print on the bag is from Salt Water. I also used Neptune for the bottom side areas. I laminated it & the bag bottom with with Slicker by Lazy Girl. This way I can just wipe dirt off of them! The last bag is my duffle. I made this one from Neptune fabrics yesterday. 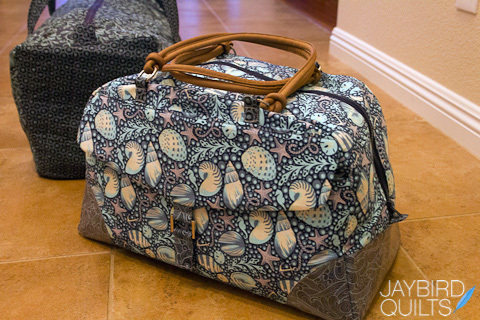 I didn't use a pattern, I just based it off of my Vera Bradley duffle bag. I also made a zippy pouch from Terry Atkinson's pattern Cash & Carry. It fits nicely inside my Lily Pocket Purse. 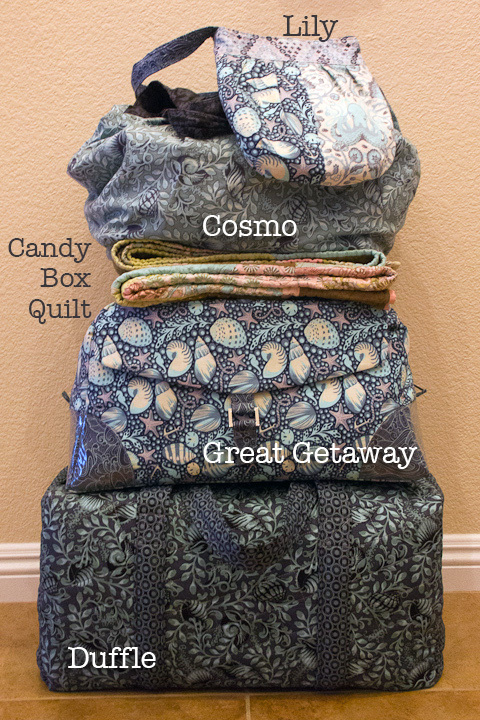 I'm very excited to use all my Tula Pink bags for this trip!! I won't be posting while I'm gone but you might see a photo or two pop up on Instagram or Facebook. Have a very happy & safe new years eve!! Beautiful bags and you are so creative. Safe travels and happy new year! Love all of your bags. Especially love your duffel bag - I want one. 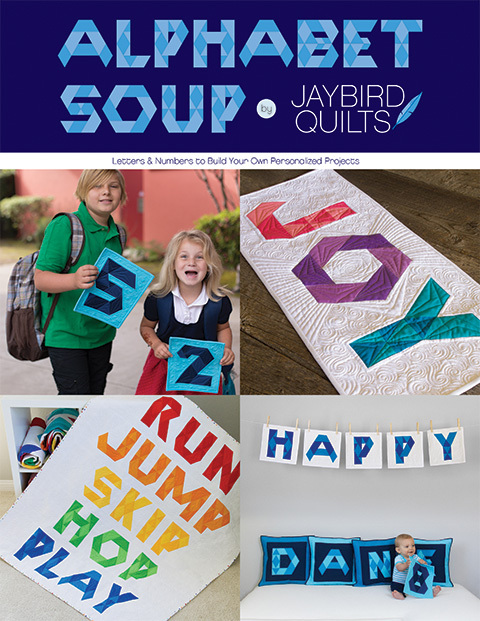 Would love a pattern, tutorial or measurements. Have a great NYE!!!! 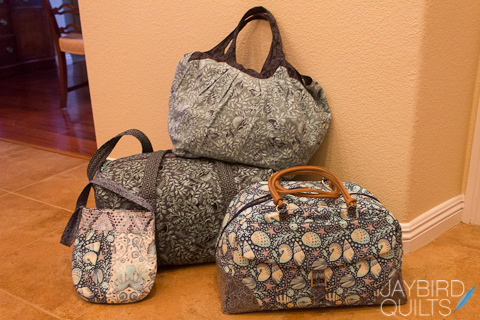 What a beautiful set of luggage you've created for yourself - completely awe inspiring (and inspiring! - a big bag in one day!) Have a great trip - Happy New Year! What fun! I love seeing your collection together and walking through each one. Great job on all the bags. Have a wonderful trip! Oh my goodness!!! I love every bag you made. I have Lisa Lam's book & so want to do that bag - maybe today? Wish me luck! You are definitely going in style!!! I love seeing all these awesome creations hanging out together! 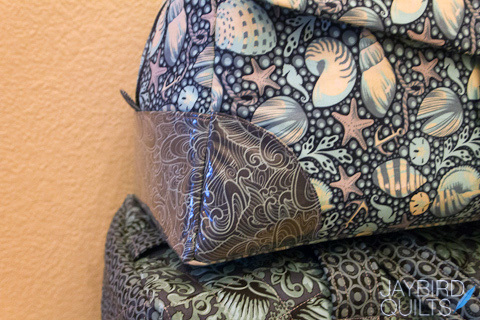 Each bag has it's own personality & usefulness! I'll take one of each! Your ability to create is awe inspiring! Safe travels! What a fun post Julie! 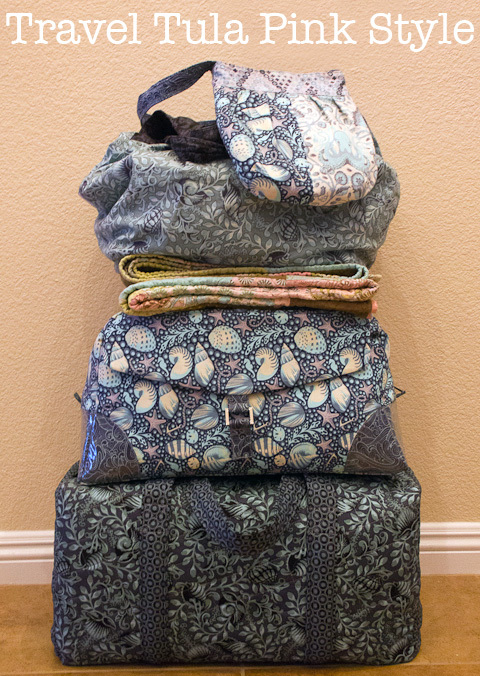 I love sewing all the bags piled up together, such inspiration! Have fun on your trip and Happy New Year! An absolutely wonderful collection of bags you've created here!! Thank you for a very inspiring post, like so many you've shared with us over the past year! Have a great trip and a very Happy New Year to you and your loved ones!! Så fine dei er ! A great collection. Happy new year! Gorgeous! 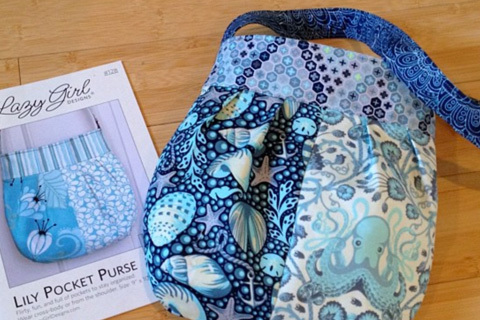 I just bought the Lily Pocket Purse pattern last month - fun to see it made up. Guess I'm starting small but you've given me great ideas to go bigger! Oh, Julie, you're so brilliant. Can I just be you? Maybe not all the time, but at least sometimes? Please? These bags are gorgeous. Everything you make is just amazing. Really, I think I just need to be you. Love everything!! Happy New Year! Your bags are beautiful and inspiring! The bags are great. You make me tired. lol Have a great New Year. Julie, you are amazing, no stopping you and will look Fantabulous walking aroung with all this gorgeous stuff!!!!! How fun! I do a lot of traveling in the fall - maybe if I start now I can travel handmade, too! Wow! At first I was a bit jealous... but I soon decided to just be happy for you. Nice luggage. Nice work. Hope you enjoy your New Year! I,too, started out jealous but now I am just amazed and thrilled for you! Fabulous. Love the colors. I am not a Tula fan generally but the way you've put these fabrics together make me think I might could be some day! You are one stylish traveler, have big fun! I love the way you blended the fabrics for your bags. This is a wonderful collection, and it is very inspiring. Hey Julie, these are great! Hope you had fun in Philly. I will be patiently awaiting the pattern for your duffle bag! And how on Earth did you manage to come up with so much Neptune?!! LOVE IT! An inspiring collection - love all your bags! And thanks for the link to slicker - neat product! Great bags! Makes my want to pull out my bag books and return to making a few bags. I haven't made a bag in at least a year. Thanks for the inspiration and motivation you provide. The best ever travel luggage! Did I already tell you that you are brilliant?